These are some of the larger projects that I've done over the last 15 or so years. Enjoy! 1 Blanket Chest This is one of my favorite pieces. The picture just doesn't do it justice. 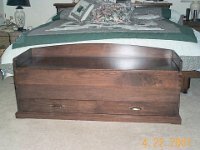 This blanket chest is made from solid walnut and the bottoms of the drawers and chest are lined with aromatic cedar. 3 Break Front Cabinet This was one of my more ambitious projects. It was built from plans available from the New Yankee Workshop. 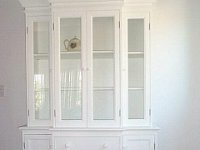 It is solid poplar and sprayed with ApolloCoat satin white. 4 Dining Table This table was patterned from a photograph found in Better Homes and Gardens magazine. It was made as a mate to the Breakfront Cabine (previous photo). These two pieces now grace the same kitchen. The top is Corian. This table is 36" tall and measures 30" x 48". The matching chairs are the same height as kitchen stools. 5 Baseball Display Over the years I have accumulated a bunch of autographed baseballs (Tony Gwynn, Hank Aaron, Bill Mazeroski, Cal Ripken Jr., etc.). I wanted something neat and simple to display them, so I made this stand from rosewood. The shelves are attached with sliding dovetails, and each shelf has four holes for the plastic baseball covers. 7 TV Tables This is photo shows one of the TV tables that I made. It is my own design. Notice how the table cantilevers over the lap so the food can be reached more easily. I made four of these tables complete with a rack in which to store them when not in use. 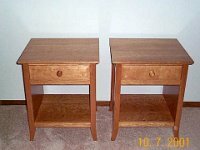 8 Cherry Bedroom Set - Part 1 The bedroom set consists of five basic pieces: night stands, armoire, dresser, sleigh bed, and mirror. These were all made using the plans from WOOD magazine (Issues 135 through 138), except that I chose to use all cherry instead of the maple/cherry combination depicted in the magazine. The finish is four coats of Waterlox Original in Satin. After the final coat cured for at least five days, I rubbed it with 0000 steel wool and paste wax for a very sensuous feel. 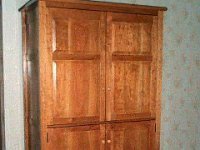 9 Cherry Bedroom Set - Part 2 The Armoire is quite large with room for a large TV with three storage drawers in the bottom section. 11 Glassware Cabinet This cabinet is adapted from plans that I got from the New Yankee Workshop. The wood is pecan that has been dyed to coordinate with the other living room furniture. 12 Computer Desk When I saw this desk in Popular Woodwooking magazine, I knew right then that I would have to build it. The curved legs and feather-light feel just yelled out "Build me! Build me!" It now holds my laptop computer. In January 2011 I added a chair with the same style legs (see next photo). 13 Desk Chair The Desk needed a chair. This one copies the leg design from the desk. Made from walnut to match. 14 Bubinga Table I also found this table in Popular Woodworking, but it was Maple. 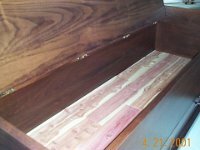 I had a beautiful piece of Bubinga veneer that was crying-out for a project, so I used that. The legs and trim are walnut. 15 Crystal Display Cabinet When my wife's mother died, she left a large collection of Swarovski crystal. 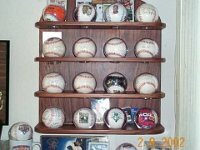 The collection sat in storage for a few years until my wife Patty saw this display case in Wood Magazine. Now the crystal collection is on display. 16 Christ Community Church Lecturn My best friend, Ron, attends Christ Community Church here in San Diego. They needed a new lecturn. Together, we designed and built this piece which now graces their church. The front is book-matched and both the front and sides are from the same slab of walnut. The bottom is weighted with 20 pounds of lead shot to reduce the chance of tipping. 17 Carolyn's Table This drop-leaf table was made for my best friend's daughter to commemorate the award of her Doctorate in Mathematics. The table is cherry embellished with some Line and Berry details. 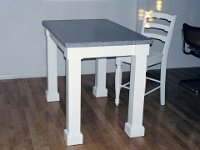 18 Floating Table This is my rendition of the "Floating Table" that appeared in the June 2015 issue of Popular Woodworking. The legs curve inward from the front and outward from the ends. 19 Tina's Bedroom Set - The Bed My daugther, Tina, needed a new bedroom set. This project took over a year to complete because of logistics. Here is the first piece of the set - the bed. The drawers are on 28 inch full extension slides. Each two-drawer module is a separate assembly. then the head board and the filler piece next to the headboard. Total of 5 assemblies that are bolted together for easy transport to her second floor bedroom. 20 Tina's Bedroom Set - The Desk Next came the desk. Again, multiple pieces to facilitate transport when necessary. 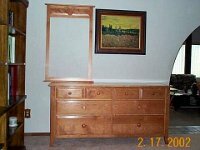 21 Tina's Bedroom Set - The Dresser And the final piece - the dresser. Tina is an artist and she uses this dresser to store her drawings and paintings. Her clothes go in the large drawers under the bed. 22 Limbert Tabourette This table, made from walnut, adorns our entry way. It is a copy of "Limbert Tabourette" from Popular Woodworking's "The Table Book". The folding screen behind it, which I also made, is framed in walnut. 23 Game Table This is my adaptation of Glen Huey's "Draw-Leaf Game Table" from Popular Woodworking's "The Table Book". We work on jigsaw puzzles and wanted a place were we could leave the puzzle setup. I made it a little bit smaller to fit the space where we wanted to put it, and I added two drawers. The drawers have plastic trays to sort the puzzle pieces.